This region is dramatic as it is beautiful. In this section we will cover how to get here, where to stay, the geological history, rock climbing Thailand best season, and some information on Krabi province. The southern provinces of Thailand are sprinkled with a geological phenomenon specific to the local environment called a karst. A karst is essentially eroded limestone rocks and islands that were formed when the Indian subcontinent rammed into mainland Asia somewhere around 30 million years ago. A mixture of fresh water, salt water, and carbolic-acid from plant-rich soil works together to slowly dissolve the limestone leaving the impression the rock is melting like an ice-cream bar in tropical heat. The corrosive force of this particular molecular formula is enhanced by the hot and humid weather common in Krabi. Dramatic, yet relatively fragile, stalactites are formed as water is filtered through the porous limestone. The erosion process is expedited at sea level forming the overhangs that are a climber’s utopia. The area boasts spectacular beaches such as Ao Nang, Railay. and Koh Phi Phi, all offering numerous diving and snorkeling trips, restaurants, shops, accommodation, and fantastic sport climbing. Overhanging limestone cliffs and rock formations make this province heaven for rock climbers. Climbers often find themselves beginning the day working difficult climbs on the beach then ending the day soloing on local islands, safely dropping into warm turquoise water. Sporty travelers also enjoy sea kayaking, base jumping, fire spinning, and testing their balance on the plentiful slack-lines. Krabi Town is the provincial capital, located at the mouth of Krabi River as it opens into the Andaman Sea. Krabi Town has a more relaxed-local feel than other tourist destinations in Thailand. However, it can be bustling in high season because it is often a base for those traveling to famous beaches such as Koh Phi Phi, Ao Nang, Railay and Ton Sai, or Koh Lanta. You have a few options to get to Krabi. You can fly directly from Denmark, Finland, Russia, and China. Also you can fly from Singapore, Kula Lumpur, Phuket, and Bangkok. If your staying in Phuket you can take the ferry to Ao Nang and Railay West or you can take a bus or minivan from the neighboring cities. Another options is to take the overnight bus from Bangkok or Kuala Lumpur to Krabi town. A good source for information about Asia and Visa Regulations you can find with our friends at Awesome Asia Travel. From Krabi town you can take a taxi, van, local bus or motorbike-taxi to Ao Nang Beach. There you need to take a water taxi on a local boat know as a Longtail Boat. It costs 100 THB per person to get to Tonsai beach. It’s possible to climb year around regardless of the season! Though the official rock climbing Thailand best season is from October to March. You’ll generally find warm dry days and relatively cool nights in the high season. There are more tourists this time of year and accommodation is a bit more expensive. Most backpackers and climbers prefer staying on Tonsai because prices are more reasonable. March, April, and May are normally hot and sticky, especially between 11am and 4pm; however, tourism begins to slow down and prices for accommodation go down a bit. Though this is considered the “Rainy Season” it certainly doesn’t rain everyday. There are fewer people and accommodation is much cheaper. Many find this is the optimum time to climb because of cooler temperatures, cheaper accommodation, and no waiting around for routes to open up. Remember, there are no guarantees when it comes to weather, high season or low! However with global climate change, seasons are not as defined as they use to be, and has become quite unpredictable. A good weather resource is WindGuru and Windy. There are a number of bungalow resorts in Tonsai. Everything from basic wood/bamboo bungalows until small upscale resorts. However prices are very reasonable here compared to Railay or Ao Nang. Most bars and bungalows are at the back of the valley. Tonsai Resort’s restaurant is right on the beach front, next too freedom bar and the climbing sectors on the beach. Apart from the bungalows there are a number of bars, restaurants, street food, climbing shops, massage places, and mini-markets. 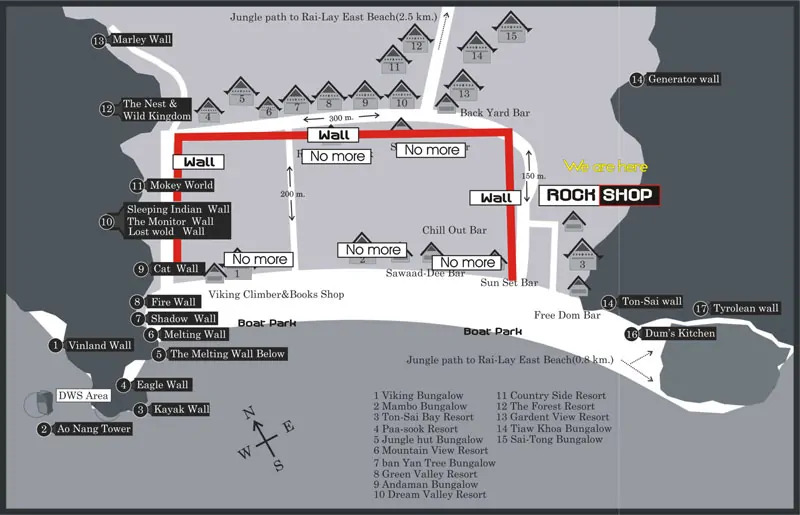 On Tonsai there is no ATM, but in walking distance on Railay Beach there are two. The most famous bars are Small World, Backyard, OneMore, and Freedom on the beach. Great places to chill-out after a day of climbing. Take a nap in a hammock, play some pool, or work on your slack-line skills!!! A few of the resorts/bungalows you can find on Agoda or Booking, but most you need contact directly or just show up. The places you can book online are Tonsai Bay Resort, Dream Valley Resort, Chill Out Bar & Bungalows, Jungle Hut, Pasook Resort, and Chill Out Jungle Bungalows. Some of the other resorts are Tiew Khao (Sai Ton), Green Valley Resort, and Andaman Nature Resort. The only resort that is literally a few steps away from a climbing crag is Pasook Resort, a favorite among climbers. Below you will find a map of Tonsai and the facility locations, no matter where you are, you are never far from a crag. You can take a longtail boat from here to Ao Nang or Ao Nammao by flagging down a boatman in a red shirt. Keep in mind, these guys have formed a union and set prices. You might be able to bargain if you are organizing a private tour, however, prices for regular boats are fixed. Boats leave when they are full (about 8 people) but if you are in a rush and there aren’t enough people, you can pay the difference and leave straight away. Tonsai and Railay beaches wouldn’t be accessible without these guys which means you wouldn’t be able to climb, kayak, bounce on the slack line…anything…without them. Please be respectful.